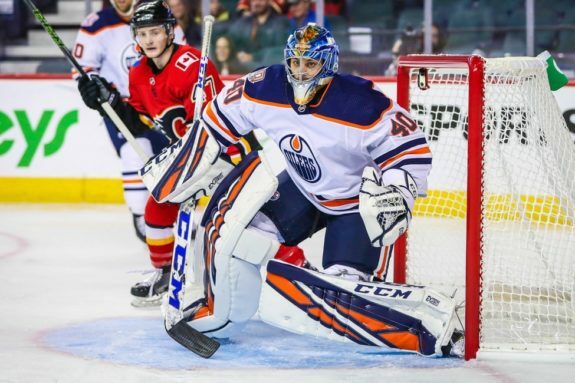 In this edition of the Edmonton Oilers Prospect Update, we’re going to be focusing on all things goaltending within the organization. For the first time in a long time, the team can boast about having five goaltenders that are 24 year’s old or younger. Believe it or not, there’s some depth here. The real question is how much of that depth will result in NHL talent? Without a shadow of a doubt, the closest the Oilers have to a No. 1 amongst their youngsters is between Stuart Skinner and Olivier Rodrigue. Both were picked within the top 78 selections of the draft (Skinner 78th, Rodrigue 62nd), and both come with some pedigree. Not to be outdone, Hayden Hawkey is off to a strong start in the NCAA. Dylan Wells is still trying to find his pro legs, while Shane Starrett is yet to play this season. Regardless there’s reason to be excited about what the Oilers have in the pipeline here. So let’s take a look in this edition of the Oilers Prospect Update. A draft day trade back in June essentially went by quietly when the Oilers moved a fifth-rounder in next year’s draft to acquire Hawkey, the 177th pick back in 2014. The 23-year-old was coming off three successful seasons with Providence College and is playing out his final college season. Providence has done a stellar job in recent years developing Jon Gillies, Nick Ellis, and now Hawkey as their starters in succession. The pickup gives Edmonton five crease prospects that are 24-and-under within the system. It’s expected he signs with the Oilers next spring after his NCAA season concludes. In that scenario, he’ll likely receive a one-year entry-level contract (ELC), the maximum duration for a 24-year-old unsigned prospect under the CBA. His numbers compare very well to what the Oilers had in the now retired Nick Ellis, and Shane Starrett (see below). His boxcars this season have been very good as he carries a 1.51 goals-against average (GAA) and a .931 save percentage (SV%) through four games. Hawkey’s SV% ranks 11th amongst all NCAA goalies who have played three or more games, while his GAA sits ninth versus the same sample group. A couple of things here with Rodrigue. As most Oiler fans know, he was the top-ranked North American goalie heading into the 2018 NHL Draft according to NHL Central Scouting. Edmonton liked him enough that they traded up a package of picks to get into that No. 62 spot to select him. So far early into the 2018-19 season, there are a few good things to note about the 18-year-old. He’s been selected alongside another Edmonton prospect (Ryan McLeod) to play in the annual Canada-Russia series. 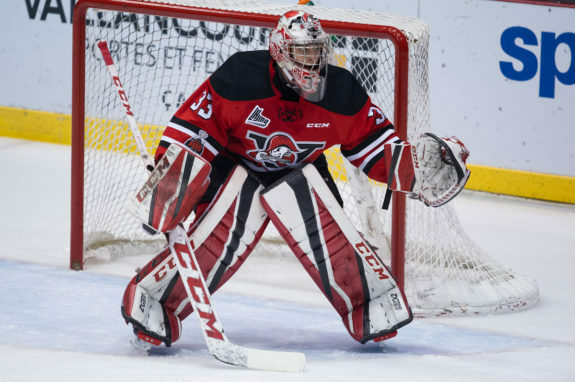 Rodrigue also picked up his first shutout of the season in a 4-0 win over the Gatineau Olympiques on Oct. 20. While sporting a 6-5-0 record through 11 games, Rodrigue sits tied for fourth in the QMJHL for most wins in this young season. His 2.64 GAA sits seventh amongst QMJHL starters that have played a minimum of five games. The Oilers second-rounder’s .885 SV%, however, sits right in the middle at 16th in the league. Rodrigue is likely in the running for a spot on Canada’s roster for the upcoming World Junior Championship (WJC). He’s competing with the likes of Michael DiPietro, Matthew Villalta, and Matthew Welsh among others. A lot has been written about the big year that Skinner had with the Swift Current Broncos as he led them to a WHL Championship and a berth in the 2018 Memorial Cup. He’s more or less picked up where he left off since graduating to the pro ranks and being assigned to the ECHL’s Wichita Thunder. The goal was to let him see a lot of pucks and get accustomed to the pro game, and Edmonton’s getting some early returns on that. While Skinner sports an impressive 3-0-0 record with a 2.53 GAA and a .928 SV%, he’s been peppered with shots. With 111 shots over three games, Skinner sees an average of 37 shots per game. That puts him behind just Allen Americans’ goalkeeper CJ Motte (41.2) and the Brampton Beasts’ Jake Paterson (38.2) as the busiest netminder in the ECHL. Starrett was late to join the squad down in Bakersfield because he was still up with the Oilers to start the year when they were over in Europe. However, he’s yet to play his first game of the season. So far he’s been riding shotgun to Al Montoya who’s seen the bulk of the starts in the AHL. With the recent developments, it now looks like he’ll have to continue waiting until the weekend to potentially play. The organization played some musical chairs with Starrett being reassigned to the ECHL, while Stuart Skinner moves up the ladder to the AHL. It’s challenging to find goalies with that combination size (6-foot-5) and athleticism. The 24-year-old has that rare combination which makes him an intriguing prospect. It’s an important year for both the Oilers and Starrett as he’s a restricted free agent (RFA) next summer. Last year Starrett sported a .912 SV% in 38 games in the ECHL, with a brief stint in the AHL. The highlight of his 2017-18 season was being selected to the ECHL All-Star Classic as a representative for the Mountain Division All-Stars. Edmonton’s six-round pick from the 2016 NHL Draft is coming off a rough season with the OHL’s Peterborough Petes. Some believed he was better than the numbers showed (56 GP, 3.62 GAA, .896 SV%) after having such an incredible 2016-17 season where he led the Petes to an Eastern Conference Final appearance. However, since turning pro, it hasn’t been the start that Wells might’ve wished for. He got into one game with the Condors on the opening weekend of the AHL season and was torched for five goals in a 5-1 loss to a deep San Jose Barracuda team. After that, he was sent down to Wichita and suffered another loss (4-1) against the Allen Americans in which he made 30 saves. All in all, we’re looking at nine goals against in two pro games (4.50 GAA), and 56 of 65 pucks stopped (.862 SV%). It’s not rosy, but there’s plenty of room for improvement as the year progresses. Stay tuned for further updates on the Oilers prospect pool. Let us know in the comment section below if there’s any Edmonton prospect that you’re intrigued to follow as the 2018-19 season progresses.